The perfect present for the Coffee Lover. If you have a coffee addict on your gift list like I do, this Starbucks Coffee Christmas Gift Set would make a great gift. �	16 oz ceramic Starbucks Coffee Mug with Lid. 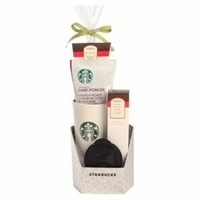 Anyone who is a Coffee fanatic will love to receive this Starbucks gift set for Christmas. It is perfect gift for friends, family and let's not forget about the teacher's.